Invercargill man Willy Calder says the leadup to oyster season is like waiting for Christmas. “I can’t sleep the night before,” he says. As March 1 approaches, those in the industry prepare themselves for the first catch of the season. Oyster catching is in Calder’s blood. It began with his grandfather, flowing down to his father and now two of his sons and his daughter have come aboard to help out. “It’s what we’re bred to do,” Calder says. He was 16 years old when he began catching. He has been a skipper since he was 19. The first day out on the water for oysters was a comfort, despite some rough weather. Things have changed somewhat in Calder’s 41 years. The seasons are shorter and fewer oysters can be caught. “It’s about 12 per cent of what we used to catch,” he says. In the off season he breeds horses in Australia. It keeps him busy until the days leading up to March 1 creep up. There’s no longer the same competition between oyster catchers, Calder says. He’s been doing it for years and there’s no chance of stopping him any time soon. As long as there are oysters in the sea, Calder will be out catching them. Oysters were in high demand on the first day of the season this week. Many Southlanders had to wait until March 2 for their first taste of the season’s batch, while dozens of oysters went northbound to the likes of Queenstown, the West Coast and Christchurch. Cars drove slowly past the Barnes Wild Oysters store, faces eagerly pressed to windows in the hope of scoring their share of the delicacy. But the start of the season got off to a wild start on March 1. The weather wasn’t playing the game and instead of oysters being opened on Tuesday morning, they would have to wait until Wednesday. 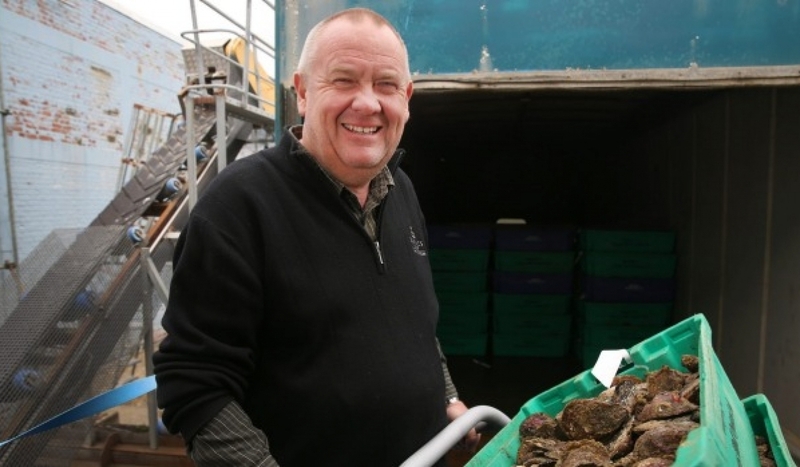 Barnes Wild Oysters manager Graeme Wright says to the untrained eye, searching for the perfect oyster spot is difficult. But to those who have oysters running through their blood, they know the ideal places. “We have historical knowledge when it comes to catching them,” he says. If the crew aren’t getting at least four to five sacks full of the shellfish, they’ll move on, he says. There are 11 boats with one skipper and about four crew members. Most people on board are born into the lifestyle. For most of the year people in the oyster industry work their farms, go about other fishing or are retired. But for the five months between March 1 and August 31 oysters are their life. “It’s almost a hobby,” Wright says. As far as he’s aware there have been no disasters involving oyster boats in his time. It is a reasonably dangerous job, but the skipper makes the decision whether or not to go out, Wright says. The notoriously dangerous Foveaux Strait can be an unforgiving environment. But no matter what, if oyster catchers shouldn’t be out there they won’t go, he says. A few years ago the oyster world was in the grips of Bonamia ostreae, a parasite that causes the mass death of European flat oysters. Foveaux managed to survive but in 2001 Barnes has to close for three years in an attempt to repopulate the oyster fishery. As for the future, Wright is unsure where the oyster industry will be. Waihopai Runaka chair Michael Skerrett says oysters were an important staple for Maori “back in the day”. The Te Ara Encyclopedia says Foveaux Strait oyster beds have been dredged since 1863, first on small beds that soon depleted, then on to a larger bed discovered in eastern Foveaux Strait from 1888 until the 1950s. The first outbreak of Bonamia exitiosus hit in the 1930s, killing many of the shellfish. It struck again in 1960s and between 1986 and 1992. Oyster catching has been in in Skerrett’s family for quite some time and because of that he has got a great interest in it. The amount caught these days is a lot fewer than it used to be, Skerrett says. “A sack could hold about 900 oysters. In 1983 there would be about 500 sacks for 23 boats. But he still loves the delicacy, trying to have some every season. “I like to have a feed of them every now and again,” he chuckles.